Is it a myth that certain drumming legends have an inimitable 'feel' on the kit? Re: Is it a myth that certain drumming legends have an inimitable 'feel' on the kit? I've seen Eric Clapton with three virtuoso drummers: Phil Collins, Steve Ferrone, and Steve Gadd. They all brought their individual style to the gig. 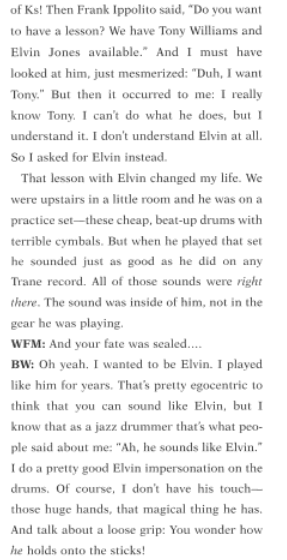 I'm sure that Eric didn't tell them to try to sound like Ginger Baker when doing White Room or Badge. Even though they were playing the same notes they were all different. And they were all fantastic! If they were good enough to get a call from Clapton, that's good enough for me. Which drummer’s feel, out of all the Weird Al songs you’ve done, has been the hardest to imitate? Agree with others here. Good points. I also think a big part of what we call someone's feel or touch, comes down to their default, go-to style of playing. The phrases they often use, their vocabulary, the subtle manipulations they do to dynamics and time. Feel is very much that: "Feel". How one truly feels (literally their emotions and energy levels), the body movements that feel really good to them, these really can come through in subtle ways. Even if we all find that paradiddles feel really good to play physically, and we are particularly happy on a certain day, our feels can still be different when all playing the same simple beat (for some it won't and for those whom it might, the difference may be extreeeeemely subtle). Personally, my feel comes from a wide number of things that are part of me and have influenced the person I am, and I can understand how they come through in certain ways: Having an ADD personality, having had a major injury to my right hand, loving abstract art, disliking traditions, enjoying astronomy, the sluggish feeling I like when getting drunk. These all inform my mental and physical way of playing. There are countless microscopic elements that go into how an individual sounds. Benny might be able to get close to Gadd, but it would still be different because he's not Steve Gadd. I'd submit that it would be harder to tell the difference between drummers who are playing hard - blast beats, high speed triggered playing is going to sound more similar than different, but when you consider the nuances between the approaches of different drummers in a setting where the subtleties can be better noticed, it's going to be easier to tell. I think that Chet Baker said it best: "well, if I could play like Wynton, (Marsalis) I wouldn't play like Wynton." So which one is Keltner which is Ferrone? which is Marotta or Purdie? You can look it up but that'd be cheating. Or maybe you're encyclopedic of album credits and know already. my impression of Keltner ... edit... already second guessing myself on this one...I feel like I just took an exam I forgot to study for! Be gentle as you decimate me please, im sensitive. I blame computer speakers and that is holding back the tears so let me have it. Thanks for taking the challenge, you had asked for. I wouldn't of got these either, other than 1. ...maybe. My point was I think studio drummers can adopt a lot different feels not just their own. In this respect not every drummer is recognizable only on their feel, so they can be difficult to pick out one another from listening alone. Im talking studio drummers here....some of who are also legends. Try telling Porcaro from Gordon on some older Steely Dan records...not easy. Absolutely soul crushing. Im not only quitting playing but also listening to music...well Ill listen to music but not the drums, never the drums, not anymore, not after what they just did to me. Like i said before, even within the musical context of a unfamiliar song, people fail 9 times out of 10 when they have to tell which drummer is playing..
Then imagine you would only hear the drumpart..
Or just test yourself when the next Mike Stern or Lee Ritenour (or any of such guys) album comes out, without looking any credits, and then try to recognise and say which of the 4-5 drummers on the album plays on which song..
Really, there is no one on this forum who will not fail with that.. I see the whole discussion centering on techniques copied by other drummers but I think the question is the different approaches drummers have: give all the famous drummers a song without sheet music or charts and have them play to it, just to see the different approaches they have. That would be interesting IMO. I could hear the difference between someone like Meg being impersonated by Vinnie....when things get sloppy around Vinnie he seems to feel upset and you can hear it in his playing. Meg is far "free-er" and comfortable outside and around the pocket...Vinnie hates being outside the pocket so bad that he made Zappa groove on songs that were as loose as dry sand. Its hard to play like you don't have the skills you have....try it....its frustrating and ,for me, had little application to general facility so I ditched the intent. I did drum quiz once, groups of two and two at an event. A large part was identifying drummers from various live recordings. Some were really hard even when you have a list fo 5 to choose from, even though they were the most well known guys, and they didn't necessarily do their signature thing. These days there are so many. It's not like there are top 10 guys that have a super identifiable sound. When they play on pop music some of them wouldn't even recognize themselves. So, kick drum...or...bass drum? I'll tell you what. If it's 18" or less, it's a FOOT TOM. Good job for your victory what was your score? Not a legend in the way the OP means but to try and get the Charlie Watts thing down is nigh on impossible, his technique is pretty unique. I always wondered how much of Stewart Copeland's signature sound is the result of having a Juilliard graduate (Jeff Seitz) working for him full time as a sound tech. No it's just a myth-they all just play with their own style like any other drummer-just better than any other. No myth, just like it's no myth that each drummer has a unique fingerprint. It can't be avoided really, thank providence.